Stop smoking several months prior to the surgery. This will reduce the risk of complications and also be better for your health. Nicotine can prevent healing to wounds of lower back surgery, thus increasing the likelihood of scarring and acute pain. Maintain or lose weight. There is a higher risk of complications if you are overweight. With regular exercise you will be in better shape to face the operation and also to make a good recovery. Always ask the advice of your doctor about the type of exercise you should undertake. Reduce the risk of wound infection by not shaving or waxing the wound area in the week prior to the procedure. Bath or shower either the previous day or on the day of the operation. Keep warm, especially whilst waiting and after the operation. Let the health care team know if you are cold at these times. Following the procedure you will move first to a recovery area and then to the ward. You will be encouraged to start walking the day after the operation. The wound needs to be kept dry for four – five days. The health care team will explain when you need new dressings or stitches / clips removed. If you make good progress you will return home after two or three days unless the doctor feels you would benefit from staying longer. If you are concerned at any time when in hospital or later at home, contact your health care team. Follow the instructions of your health care team carefully to avoid a blood clot, including taking medication or wearing special stockings. Follow the programme of exercises given to you by the physiotherapist to strengthen your back. The exercises will help protect you from getting similar back problems again. The healthcare team will tell you when you can return to normal activities. Make sure that you do not lift anything heavy or twist your body. Good posture when sitting and walking and regular exercise will help you to heal and get back to normal as quickly as possible. Before you start any exercises, please speak to your doctor or the healthcare team. Driving should not be undertaken until you are confident about your ability to control the car. Before you start, check your insurance policy and with your doctor. Approximately 17 out of 20 people make a good recovery from this operation, returning to normal activities. Leg pain should not be a problem but you may still feel occasional back pain due to on-going wear to your spine. Acute back pain could be caused by instability and may require a spinal fusion procedure. 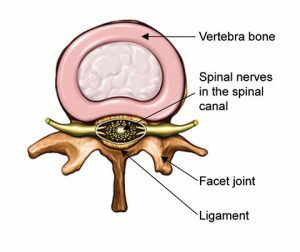 The return of spinal stenosis either in the same or a different place is possible. The probability of this is low with just 4:100 needing a second operation within four years. Keep this information leaflet safe and use it to ask questions of your healthcare professional if necessary.